Federated CEO Rusty Bishop (second from left) and Pronto CEO Bill Maggs (fourth from left) present SMP executives with the Outstanding Vendor of the Year award during the Automotive Parts Services Group meeting. (L to R): Paul Farwick, Bishop, Dale Burks, Maggs, Bill Collins, Ryan Kooiman, Ken Wendling and Eric Sills. 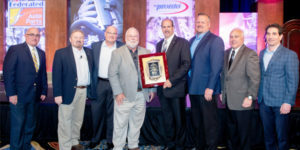 The Automotive Parts Services Group (The Group) honored its top supplier partners during its first combined member meeting held April 9-12 at the Gaylord Texan Resort and Convention Center in Grapevine, Texas. More than 650 members, vendors and associates participated in The Group meeting, attending a series of general sessions and informational meetings as well as participating in a lively vendor expo.